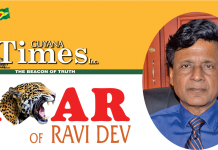 As I observe the hardening of positions between the “two sides” in our sixty-year-old internecine political struggle, I am once again struck by parallels in that ancient conflict as described in the Mahabharata and ours in Guyana. The Mahabharata is rather unique among Hindu texts in dealing extensively with the world of politics. It is about the way we deceive ourselves, how we are false to others, how we oppress fellow human beings, and how deeply unjust we are in our day-to-day lives. And, all the while, we hold fast to the belief that our position is “just”, and those of others “unjust”. But the Mahabharata also teaches that there are no “pure” heroes. Unlike what is conventionally depicted, the conflict between the two sides is not a battle between “right and wrong”; the Pandavas, the nominal “good guys”, are not perfect, and several who fight for the Kauravas, the “bad guys”, are truly noble. The potential for “good” or “bad” lies in every human being, and is frequently dictated by our circumstances. 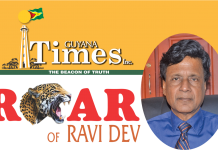 In Guyana, I have always maintained that our history has conspired to create a tragic situation. Not tragic in the sense of terrible things happening – even though we’ve had more that our fair share of those – but in the way that Hegel interpreted Greek tragedy. His famous interpretation of Antigone as the paradigmatic Greek tragedy might be particularly apt to our situation. In this narrative, both “sides” have claims that are morally right. The conflict is not between good and evil, but between “goods” on which each is making exclusive claim. The “sides” I refer to in our country are, of course, the descendants of the Africans, who were brought as slaves, and those of Indians, brought as indentured servants – both to labour on the sugar plantations. Those African slaves were, against their will, dragged across the Atlantic to work under conditions of mind-numbing cruelty. “Emancipation” had to be a bitter pill to swallow when Indentured labourers (Portuguese, WI Africans, Indians and Chinese) were brought in as “scabs” to undercut their demand for higher living wages. It was to be only the beginning of many manoeuvres to deny justice to Africans, and it set the tone of what was to follow. The Indentureds, dominated by Indians, countered that they were unwitting pawns in the British game of “divide and rule”. They could, and did, point to the increasingly meagre wages they were forced to work for on the plantations in the subsequent century. Their “saving” of the sugar industry, which was the raison d’etre for the colony, and their demonstrated capacity to produce “two blades of grass where there was but one” — under the severest pressures, as pointed out by George Lamming — formed the basis of their moral claim to justice and equality. As in the Mahabharata, both sides were promised that if they played by the rules, the “kingdom” would eventually be theirs. While we may rail against Durjodhan (and Burnham) for their overweening ambition, no one can deny that they were leaders of groups that had legitimate moral claims to power. Similarly, the gambling away of their inheritance by Yuddhistir (at dice) and Jagan (with Kennedy and Duncan Sandys) cannot be glossed over, but does not vitiate the similar moral claims of their supporters. That the two groups coexisted without major conflicts until the sixties was not coincidental; it was the majoritarian system of choosing who would inherit the kingdom in 1953 – as was the Emperor-making ceremony in the Mahabharata – that precipitated the internecine warfare that continues to the present. It was not surprising that the manipulator (the US/British here, Duryodhan’s uncle in the Mahabharata) would inveigle one side to try to grab the entire pie. The “rules”, after all, made “right” an exclusive claim to rule by each group. But we must concede that it does not make it moral. If we accept that as citizens of this land we are all equal, we must arrange the rules of selecting the rulers in such a manner as to make both sides (and indeed all “sides”) feel involved in governance. Our history, if nothing else, demands this outcome for the sake of morality. In the next elections, we hope that all parties should commit themselves to such an arrangement. The opposite, I fear, is the war of the Mahabharata, which, let us not forget, destroyed almost all – including the group backed by God Himself. War, we are taught, has no winners.